Respiratory System in Man, Animals, Fish, Birds, Reptiles & Insects etc. when a molecule travels and collides with various molecules, then it travels free path in the vessel. anyhow, all the free paths of the molecules are not equal. mean free path is average distance covered by a molecule between two successive collisions. it is denoted by ‘ λ’. mathematically, ‘λ’ is related to the mean distance traveled by the molecule in one second and its number of collisions per second. as we have explained above that mean free path is the ratio of C̅ and Z1. 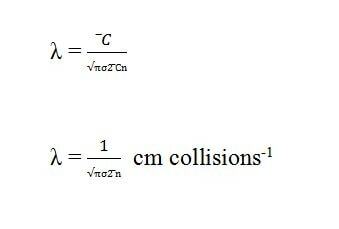 putting the value of Z1 from collision frequency equation into the above equation. according to the above equation, the mean free path of the gas molecule is inversely proportional to the square of the collision diameter and inversely proportional to the number of molecules per unit volume. it means, greater the number of molecules per unit volume, smaller the distance the molecule has to the cover between successive collisions.